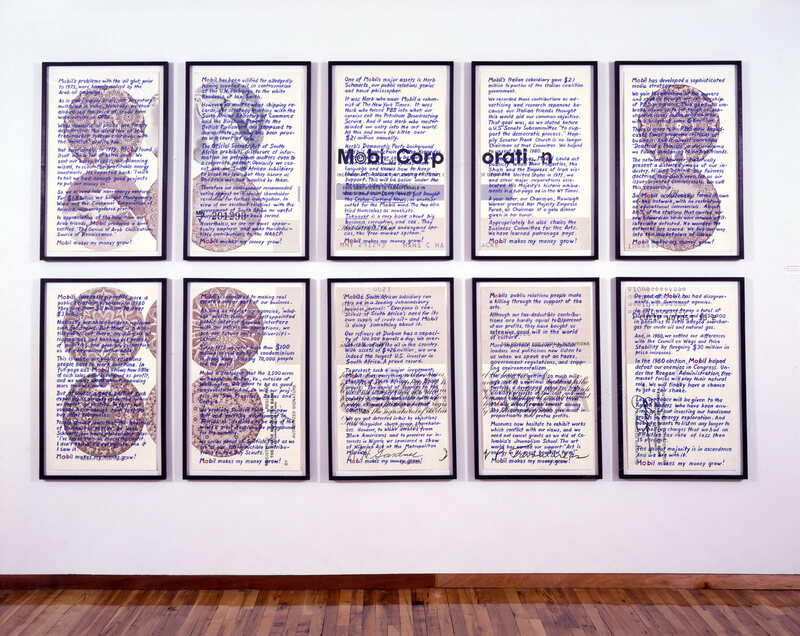 Since first encountering Bertolt Brecht’s “Writing the Truth: Five Difficulties” (1935) as a student, Hans Haacke has acted on the idea that art could be a vehicle for telling the truth—especially overlooked truths about the political and economic systems that govern our lives. Over the years, Haacke has deftly shifted his content and methods, tailoring them for specific contexts. Best known for his investigative installation projects, he has also produced prints throughout his professional career, exploiting their multiplicity and mobility: he worked at Stanley William Hayter’s Atelier 17 in Paris in 1960–61, at Crown Point Press in the 1970s and ’80s, and most recently designed a public poster campaign as part of the current Documenta. Haacke graduated from the Staatliche Werkakademie (Kassel, Germany) in 1960 and began an association with the European Zero group, founded by Heinz Mack, Günther Uecker and Otto Piene, which rejected the gestural emphasis of abstract expressionism in favor of impersonal material effects and spectator participation. 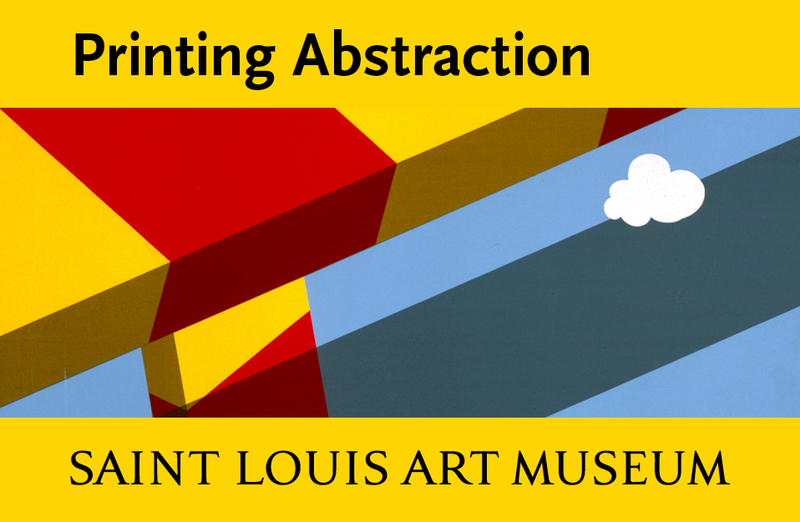 In 1960–61 Haacke was painting two-color abstractions with all-over compositions of repeated geometric forms that “tease[d] the retina and thus appeared to vibrate.”1 An international exchange grant from the Deutscher Akademischer Austauschdienst (DAAD) allowed him to spend a year at Atelier 17, where he responded to the breadth of intaglio techniques and openness to experimentation he encountered in the workshop.2 In late 1961 he abandoned painting for what he considered its falseness, and began making inkless intaglio prints.3 Blind embossing had been used by Hayter and others as a compositional complement to inked elements in the image, and also to embed makers’ or collectors’ marks in a sheet (printers’ “chops,” etc. 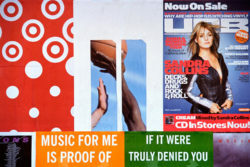 ), but Haacke elevated the technique from a supplemental element to exclusive content. 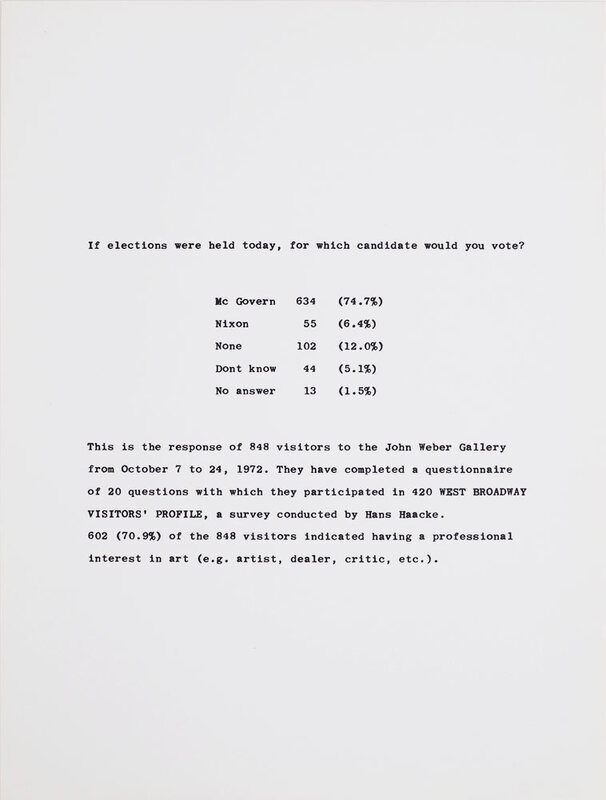 Hans Haacke, Untitled (1961), inkless intaglio, image 3 7/8 x 3 3/8 inches, sheet 9 3/4 x 12 3/4 inches. Artist proof. ©2017 Hans Haacke / Artists Rights Society (ARS), New York. In keeping with the ideals of Zero, as well as of Brecht (whose anti-illusionism called for exposed lighting in theatrical performances), Haacke valued real effects over representations. 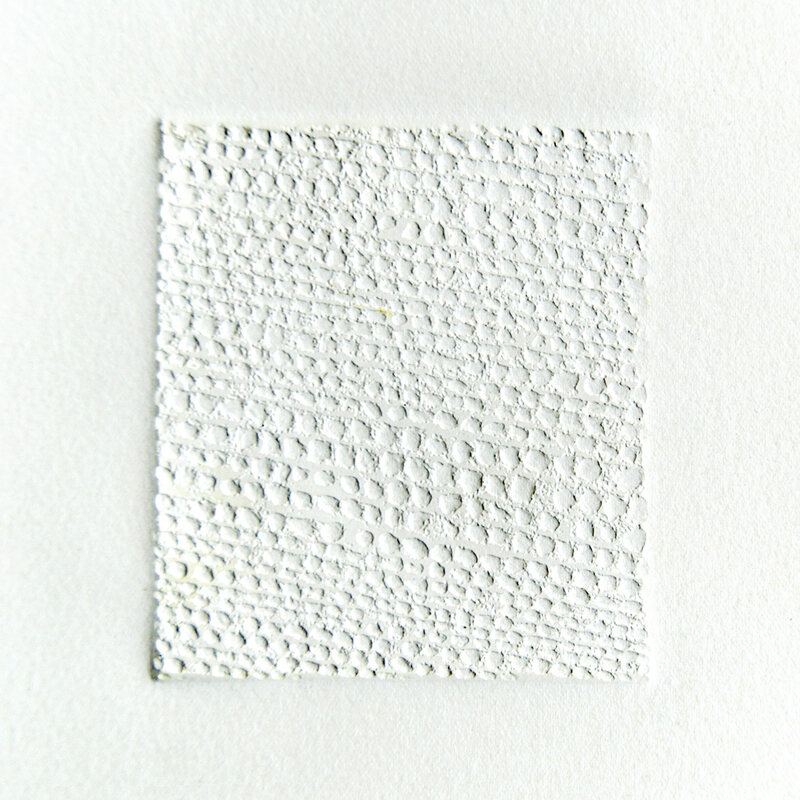 His prints, in which visual interest is generated by concrete effects of light and shadow, fulfilled his new criteria. Even so, it is possible to see the inkless intaglio composition Untitled (Number 5) (1962) as a reflection of early 1960s technological developments. 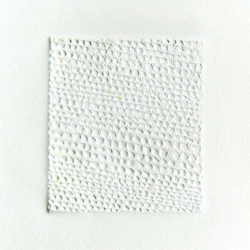 Its dimensions—roughly three-by-nine inches—and its regular clusters of chad-sized bumps are suggestive of what might happen if a computer punch card was run through a press: a poetic collision of art and technology that anticipates later projects. Sculptor George Rickey saw such use of optical phenomena, light and movement as an extension of early-20th-century Russian Constructivism.7 Though less revolutionary than their Soviet predecessors, the producers of this 1960s “Constructivism” did intend their works to catalyze new ways of acting and thinking within and beyond galleries. 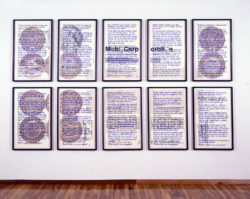 Hans Haacke, Untitled from The New York Collection for Stockholm (1973), screenprint, composition (irreg.) 4 7/8 x 6 1/2 inches, sheet 9 x 12 inches. Edition of 300. Printed by Styria Studio, New York. Published by Experiments in Art and Technology, New York. ©2017 Hans Haacke / Artists Rights Society (ARS), New York. 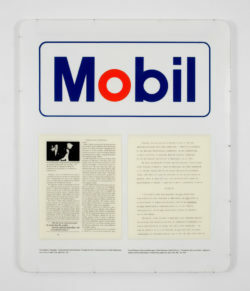 Hans Haacke, Mobilization (1975), four-color screenprint on acrylic, 48 x 57 1/2 inches. Edition of 6. ©2017 Hans Haacke / Artists Rights Society (ARS), New York. 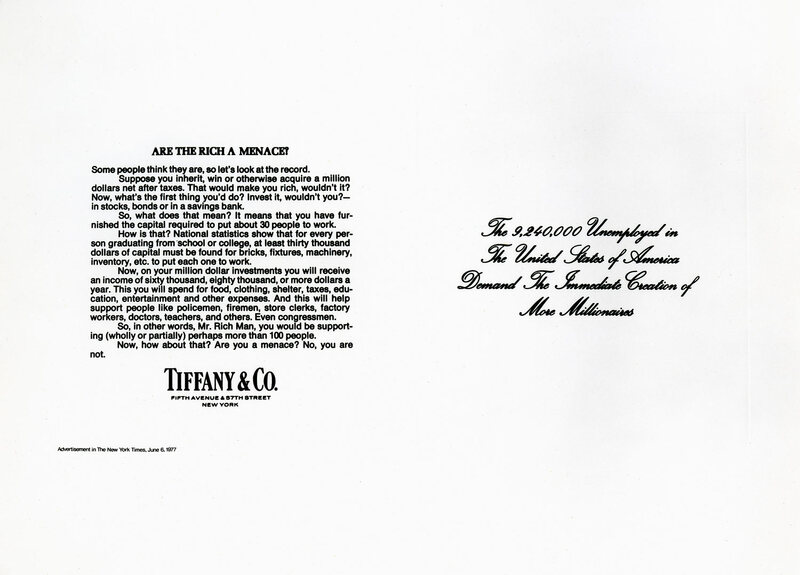 Hans Haacke, Tiffany Cares (1977-78), photoetching, image 34 1/4 x 17 inches, sheet 41 x 29 inches. Edition of 35. Printed and published by Crown Point Press, San Francisco. ©2017 Hans Haacke / Artists Rights Society (ARS), New York. 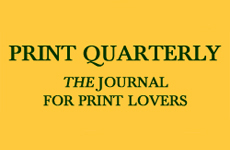 The print takes its title from two sources, both of which serves as PR for Mobil: the popular British Edwardian soap opera “Upstairs, Downstairs,” which ran on PBS with conspicuous support from Mobil, and an advertising campaign of pseudo–Op Ed essays, each of which began “Musings of . . .” Haacke wished to highlight the degree to which the Public Broadcasting Service was privately bankrolled (Mobil’s contributions to PBS were so dominant that some dubbed it the “petroleum broadcasting system”).23 There were concerns that, in addition to generating goodwill, Mobil’s support may also have had an impact on programming decisions, such as the airing of economist Milton Friedman’s ten-part 1980 series, “Free to Choose,” advocating free-market economic policies.24 The “Musings of . . .” advertisements similarly adopted an appearance of disinterested public service, presenting themselves as brief essays penned by “an oil person,” a “confused oil person,” a “proud oil person,” etc. Both halves of Haacke’s title thus raise questions about the power of covert interests in the public sphere. 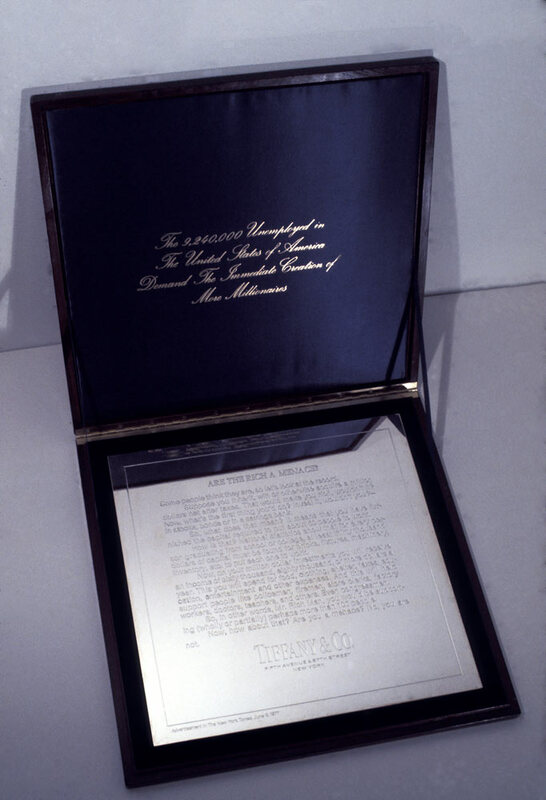 Hans Haacke, Tiffany Cares (1977-78), Brass pedestal, wood, velvet, silver-plated copper plate with etched text, satin with gold stamping, 33 3/4 x 22 x 22 inches. ©2017 Hans Haacke / Artists Rights Society (ARS), New York. Haacke had ceased signing artworks with his full name in 1962, hoping to combat the cult of the author, but Upstairs at Mobil bears his full moniker, which had been printed on the original document to certify his ownership. In the process becoming a shareholder, Hans C. Haacke was inscribed into the firm’s registers alongside a serial number. In breaking the certificate up onto ten plates, Haacke sliced his name in two: “Hans C. Ha” appears on one print, “acke” on another. The corporation’s name is broken up as well. 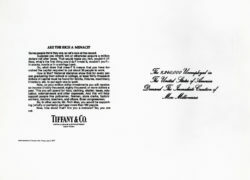 Haacke’s replication and mutilation of the certificate, of course, had no bearing on the consequences of stock ownership: dividends for ten shares continued to be sent to the artist. The Official Secrets Act of South Africa prohibits disclosure of information on petroleum matters even to a corporate parent. Obviously we cannot ask our South African subsidiary to break the law . . . Under the Reagan Administration, free-market forces will play their natural role . . . The moral majority is in ascendance/ And we are with it. Through the act of reframing, Haacke lets Mobil reveal its sinister side. Hans Haacke, Commemorating 9/11 (2001, printed 2002), wheat-pasted, die-cut posters, 18 x 24 inches. 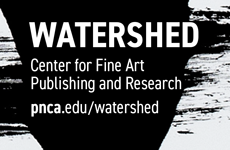 Published by Public Art Fund, New York. ©2017 Hans Haacke / Artists Rights Society (ARS), New York. Positioning Haacke’s recent print endeavors are engineered to interrupt advertising, the form of print that most permeates urban life.31 In 2001–02, he returned to inkless printmaking for a Creative Time commission marking 9/11: white posters with die-cut silhouettes of the World Trade Center were wheatpasted over existing commercial announcements, cancelling and reframing what lay below, marking commerce and also absence. 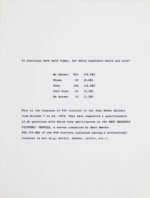 Hans Haacke, Wir (alle) sind das Volk—We (all) are the people (2003/2017), 10,000 posters, dimensions variable. ©2017 Hans Haacke / Artists Rights Society (ARS), New York. 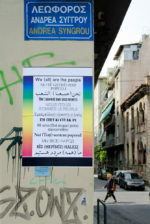 His posters come at a time when the accommodation of refugees from Syria, Iraq and Afghanistan has divided voters throughout Europe and North America, with Germany taking far more than any other nation. Haacke repurposes historically charged language to reckon with the reality that the distinction between citizen and refugee is imposed by circumstance and is mutable—an acknowledgment that leads to practical questions of who should be able to freely enter and access rights within the nation state. Implicit in his selection of languages is an address to people on both sides of this divide, and an attempt to disrupt the monolingualism that often serves nationalism. Haacke carefully selects his data and precisely choreographs its delivery; he does not mandate fixed conclusions. Rather, his prints—inkless intaglios, corporate designs and speech providing damning information, and recoded statements advertising inclusion—are poetic and political short-circuits. His challenging prints must be worked out by spec-tators; they probe their audiences’ commitments, asking them to move in new directions and strike their own positions.